VW will launch the production version of the I.D. concept, shown, in 2020. 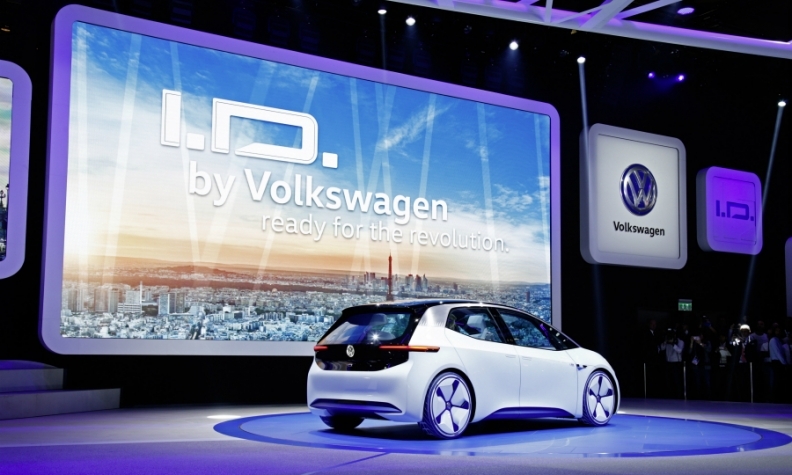 VW would need to spend 20 billion euros to build batteries in-house for all its planned EVs. Last February Daimler CEO Dieter Zetsche ruled out investing in battery-cell production for electrified powertrains because supply was already exceeding demand. "The dumbest thing we could do is to add to that overcapacity," he said. Less than a year later, Volkswagen Group is signaling the exact opposite concern as it sizes up contenders for one of its biggest contracts in recent history: cell supplier for cars that will be underpinned by its forthcoming MEB electric platform. "The capacity is not there. Nobody has the capacity," Thomas Sedran, VW's head of group strategy, said last month of the six largest global cell suppliers competing for the contract. Much has changed between the time that those two statements were uttered. Automakers are under increasing pressure to electrify their powertrains to meet toughening global emissions regulations. The big question is whether there will be enough battery cells available in the next decade to meet the fast-rising demand predicted by automakers such as VW Group, Daimler, BMW Group, General Motors and Ford Motor. VW Group is leading the charge. Europe's largest automaker has said it expects to sell between 2 million and 3 million full-electric cars annually by 2025. There is good cause for this optimism. 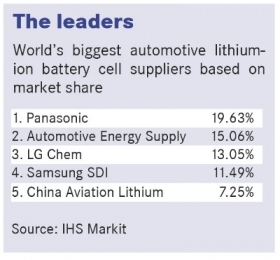 Last year GM, Renault and their battery partner, LG Chem, did much to remove one of the biggest hurdles to EV sales – range anxiety. GM says the Opel Ampera-e [sold as the Chevrolet Bolt in the U.S.] can travel more than 500 km on a single charge while Renault says the second-generation Zoe has a range of more than 400 km (range projections are for Europe only). The new lithium-ion pouch cells from LG nearly doubled the Zoe's energy rating to 41 kilowatt hours from 22kWh, but still fit neatly into the existing car. The next big jump in range will come around 2019, executives and analysts predict. The other great hurdle that has slowed the uptake of EVs is the price of the battery, but that is falling as energy density rises. Financial analysts at Exane BNP Paribas recently published a bullish report on EVs saying that it expects battery pack prices to halve to $215 per kilowatt hour by 2020 from $400/kWh now. It sees the price dipping to as low as $140/kWh in 2025. Daimler’s Zetsche is even more optimistic. "We can see 100 euros per kilowatt-hour on the horizon," he told Automotive News Europe without specifying when the price would fall that low. Due to the rapid decline in this cost Exane BNP Paribas predicted that by 2025 automakers will generate bigger profit margins from EVs than from cars with internal combustion engines. "We are now within sight of levels that will act as a tipping point for mass adoption of EVs," the firm added. For that, it estimates the industry would need a global battery production capacity of 600 gigawatt hours, enough to build 8.6 million cars with an average battery size of 70kWh. "One weakness in our EV argument is that it currently requires battery supply that does not exist," Exane BNP Paribas warned. Tesla's desire to make its own batteries is not shared by most other automakers largely because they lack the expertise. "Quite frankly, if we compare ourselves today with Samsung and LG they are light years ahead of us," VW Group's Sedran said. He estimated the capital expenditure needed to supply all of VW Group's EVs with in-house batteries at 20 billion euros. "We need to check whether [the six suppliers tendering for the cell contract] have the financial means to build the capacity," he added. He wouldn't say whether the contract would be awarded to a single supplier or split. Neither of Nissan's alliance partners, Renault and Daimler, believes it makes sense to produce their own EV cells. "We are a carmaker not a chemist," Marianne Bataillon, Renault EV project leader, told Automotive News Europe. Daimler boss Zetsche shared a similar view with Automotive News Europe when asked if Daimler would restart production of its own cells if the price per kilowatt hours fell sharply enough. "Politicians and unions are asking us to do that, but it would not make sense. Today, the cell is almost a commodity good so the cost is going down fast." Daimler quit making its own cells in December 2015 when it shut down its Li-Tec unit in Germany, citing costs. Zetsche said that Daimler had the best cell available but that this advantage was worthless because customers couldn’t feel the difference. Today, Daimler "pursues a competitive multiple supplier strategy" for cells and will concentrate instead on building the pack around them at its Accumotive division in Kamenz, Germany, where it is constructing a second plant. "The intelligence of the battery does not lie in the cell but in the complex battery system," Zetsche said. Christian Mueller, IHS Markit's European manager for automotive component analysis, agrees with Zetsche. The analyst expects that most automakers will focus on making the packs and developing the associated control technology in-house, partly to offset the potential loss of thousands of powertrain assembly jobs, but also to better differentiate vehicles from those of rivals. Battery suppliers will need to locate close to their customers' factories, VW's Sedran said, because transporting the cells over long distances is both costly and risky. "They are hazardous goods. You won't find insurance for shipping lithium-ion batteries." That won't be enough to supply to the predicted EV boom, but automakers aren't worried. 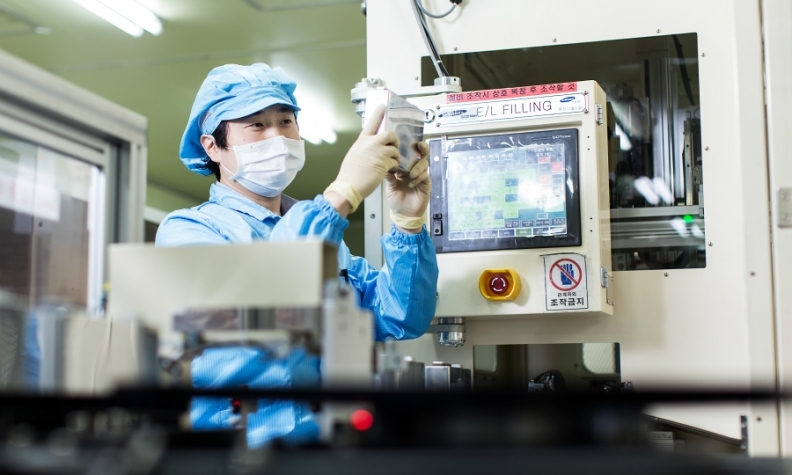 "It's hard to forecast demand in 2025, but battery cell manufacturing capacity can be increased within a reasonable time. A shortage is unlikely," Wolfgang Ziebart, Jaguar Land Rover's technical design director of product development, told Automotive News Europe. Samsung SDI is adding a battery cell factory in Hungary that is scheduled to open next year. However, any cells VW makes are likely to end up in top-end cars rather than mainstream models, at least initially. "I think the top end would be a good idea, because this is where you have to have highest density in the battery and the best charging performance. That would mean cars like the next-generation [Porsche] Mission E, or a Lamborghini maybe," he said. Solid-state batteries are preferable because they are expected to provide 40 percent more energy density than the top-level lithium-ion solutions due by the end of this decade, Sedran said. A key supplier executive said there are other benefits to solid-state batteries. "They are safer because there is no combustible electrolyte [liquid], they are 75 percent smaller and have reduced weight," Robert Bosch CEO Volkmar Denner recently told journalists. Bosch bought U.S.-based solid-state battery maker SEEO in 2014, a move that could make the world's largest component supplier a potential candidate for localized cell making in Europe. Other automakers experimenting with solid-state batteries include longtime EV skeptic Toyota, which late last year reversed its strategy, putting company president Akio Toyoda in charge of a newly formed electric car division. The hybrid specialist, which has also made a big bet on fuel cells, won praise for its commitment to the future technology. "We highly value Toyota's long-term strategy to focus on all-solid-state batteries," Exane BNP Paribas said in its report. Regardless of how quickly EVs gain share, it is clear that the trend toward electrification is forcing automakers and suppliers to make some fundamental changes to the way they operate. "In our historical business model we had very high vertical integration," VW's Sedran said, "but going forward we don't think that may be the smartest way."